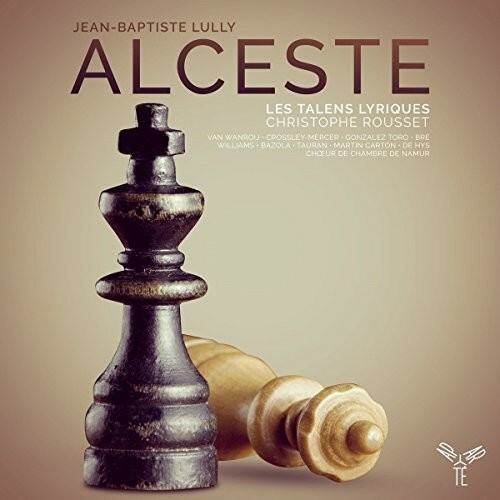 Alceste ou Le Triomphe d’Alcide is an early example of Lully’s tragédie en musique in its fledgeling form of a Prologue followed by five Acts. It uses a libretto by Philippe Quinault, based on Euripides’ Alcestis. The first performance was given in January 1674 by the recently formed Académie Royale de Musique (later known as the Opéra de Paris) at the Théâtre du Palais-Royal, adjoining the then residence of the King, the Louvre Palace. The occasion was the Louis XIV’s victory against the Spanish held Franche-Comté during the complexities of the Franco-Dutch War. Lully had only recently taken control of the opera scene in Paris and Versailles, and this was the second of the many operas created during this monopoly. Even though Versailles was not, at the time, the seat of Louis XIV (and indeed, most of it was not yet built), the sumptuous Opéra Royal (built around 100 years later, in 1770) was an appropriate venue for Les Talens Lyriques to launch this CD, with a concert performance. The opening Prologue (set in the nearby Tuileries Gardens of the Louvre Palace) is the inevitable sycophantic eulogy to the exploits of Louis XIV as a war hero. A succession of nymphs (of the Seine, the Marne and the Tuileries) join a chorus of Naides, the Gods of the Woods and a militaristic depiction of Glory, to await his return. They sing of the bringing together of Glory and the Pleasures as the latter prepare Divertissements. All but one of the singers were double, or triple, cast, so the Prologue gave an early opportunity to try and work out who was who. Three of the four female singers (the three nymphs) were dressed alike in various shades and styles of red, being designated in my notes as R1, R2 and R3. Glory, in black, later reappeared as Alceste. The plot proper open in a port in Thessaly, and the celebrations of the marriage of Alceste to Admetus, King of Thessaly. Two people who are not celebrating are Alcide (aka Hercules) and Lycomède, the King of Scyros, who are both rather taken by Alceste. Lycomède takes his feelings rather too literally and actually does take Alceste, kidnaping her during a nautical festival he has arranged for just that purpose, aided by his sister Thetis and the God of the Winds. A parallel plot involves the confidants/servants of these principal characters. Act Two sees Alceste and her confidant Céphise captive on the Isle of Scyros, where Céphise is wooed by Straton, Lycomède’s servant. Admentus and Alcide/Hercules arrive to rescue Alceste, but Admentus is mortally wounded in the process. Alceste offers to go to Hades in place of Admentus (her husband), and kills herself, leading to the elaborate Act Three funeral rites. Somehow or other Admentus turns out not to be dead after all, so Alcide/Hercules comes over all heroic (representing Louis XIV, of course) and sets off to the underworld to rescue Alceste (yet again!) having told his friend Admentus of his love for Alceste (Admentus’s wife) – as you do. Act Four depicts his journey in the underworld, with a notable scene with Charon, the ferry boatman of the Styx (here the Acheron). The last Act celebrates the return of Alcide/Hercules from Hades with Alceste and the final plot twist where he returns Alceste to her husband, to much rejoicing. Lully makes much of the frequent bouts of celebration and dancing, each Act having its moment of real musical drama, with powerful writing for the orchestra and chorus, both on excellent form both on the recording and the launch concert. Lully’s compositional style of segueing declamatory recitative with arias combined with frequent moments of orchestral focus set the scene for French opera for years to come. Although missing some of the orchestral colour of later operas, his use of the orchestra is extravagant. The percussionist, in particular, seemed to be enjoying himself with thunder, wind and battle effects, to the extent that at one moment he dropped a stick. For me, the singing of mezzo Ambroisine Bré (pictured) as Céphise (and a nymph) was the best of the concert although, curiously, I am a little less impressed in the CD, where her vibrato is rather less controlled. Notwithstanding Alceste’s title role and the Alcide/Hercules/Louis XIV character, it is Céphise who is the most prominent role as Alceste’s sidekick, but also in her dealings with her own brace of admirers. Ambroisine Bré really grasped the flirtatious young girl’s character, and her beautifully clear and focused voice will be an abiding memory, as will her impressive engagement with the audience. Fellow red dress Lucia Martin Carton also impressed in her three roles, although the third red dress, and Judith Van Wanroij’s Alceste, were to me, less impressive, not least because of their excessive vibrato. This is a particular issue in French music where ornaments and the delicate flow of melodic lines demand a clear unaffected tone. The male singers were all excellent, with Edwin Crossley-Mercer singing Alcide, Emiliano Gonzalez Toro as Admetus (approaching, but not quite reaching the distinctive French haute-contra voice), Douglas Williams as Lycomède/Charon, and Etienne Bazola in the multiple roles of Cléante, Straton, Pluto and Eole. I did wonder if, in the concert performance, there could have been rather more interaction between the characters. I have grown to like concert, rather than fully staged, performances of opera, not least because they cut out the interference of an opera director, but much of opera is about two people relating to each other which is missed if they just stand and sing. Christophe Rousset reinforced his position as one of the leading interpreters of French Baroque opera, directing with considerable attention to detail. The Namur Chamber Choir were on typically top form, with well-articulated vocal flourishes and clear diction. The CD has an English translation of the text and introductory essay, but no information about the singers.